Elsie and I cooked up a small storm of wontons and pork dumplings over the weekend. I met her at Square 2 after work on Friday for dinner and some shopping. We went up to the MMMM! store on the 4th floor. This place sells different types of meat and fish. The other time we bought some brazilian beef cut bulgogi-style and had some wonderful meals with them. This time, I caught sight of the frozen minced pork…on offer. Time for some wontons and pork dumplings (aka siew mai)! Ideal for the basic pork wonton recipe on my website. A trip to the supermarket yielded the ginger and the wonton wrappers. The packaging of the wonton wrappers claimed that they are non-alkaline and are shanghainese. (^-_^). I couldn’t find the spring onion and bought some fresh shrimps instead. After defrosting the minced pork, I processed the ginger and 3/4 cup water in a food processor, add to the pork and mix them like crazy. Salt, pepper and a little stock powder to taste and they are ready for wrapping. Deshell the shrimps and cut into small pieces. I decided to go minimalist with the wonton folding style and went with just the samosa style. Quick and easy. With water and a little oil boiling in a pot, I wrapped the wontons and placed them in the hot boiling water directly. Elsie, spoon in hand, made sure they do not stick together and scooped them up when they are done. The filing for the pork dumpling is basically the same as the wontons. We just wrapped them differently and steamed them. Like I said in my website, I am a minimalist cook. 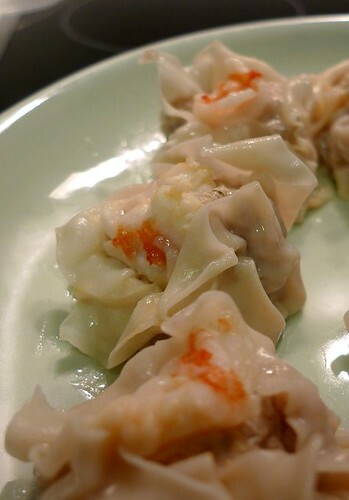 Here’s a picture of the steamed pork dumplings with a little orangy shrimp peeping out. Yummm! How is the Singapore Weather?